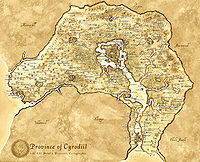 Cyrodiil, also known as the Imperial Province, Dragon Empire, Starry Heart of Nirn, and Seat of Sundered Kings, and Cyrod in Ayleid, is a province in the south-central region of Tamriel, and the home of a humanoid race known as Imperials. 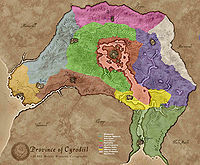 The center of their Empire and seat of governance, Cyrodiil is also known as "the Heartland". The capital of Cyrodiil, and of the whole empire, the Imperial City, is located on City Isle in the center of the province, which bears the location of White-Gold Tower, possibly the most renowned monument of Tamriel. Despite some accounts describing Cyrodiil as a jungle, it primarily has a temperate climate. One scholar of the middle Second Era attributed this discrepancy to errors made during the transcription of historical texts, while another speculated that White-Gold Tower itself gradually adapted the climate to suit the region's inhabitants. Later sources asserted that Emperor Tiber Septim altered Cyrodiil's climate upon his apotheosis. This page was last modified on 31 July 2013, at 20:50.